Recently I’ve been trying to reduce the amount of meat I consume. The aim is to reduce my carbon footprint and think harder about the provenance of the meat I do eat (in practice this is stuff lovingly cooked by trusted chums), which ideally would be from a sustainable source that treats its workers and the environment well. It might be a drop in the ocean but I’m trying to use what little consumer power I have to encourage restaurants and sandwich shops to provide a decent range of vegetarian options. As a result, for the last few months I’ve only bought/ordered vegetarian things when out and about. That grand plan all went t!ts up yesterday lunchtime when I ventured to Japanese-Peruvian chain Waka, on the promise of some Christmas Sushi. Sorry, planet! 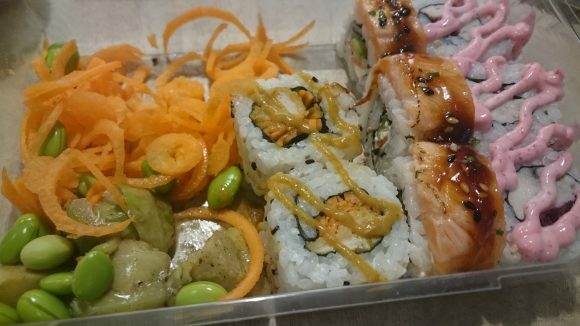 The Nikkei Navidad sushi set costs about six quid, for which you get three types of roll: Chicken katsu and carrot, smoked salmon and cream cheese, and turkey and cranberry with mushroom and chestnut stuffing. Accompanying this are some edamame beans, grated raw carrot and what can only be described as ‘sprouts in gravy’. 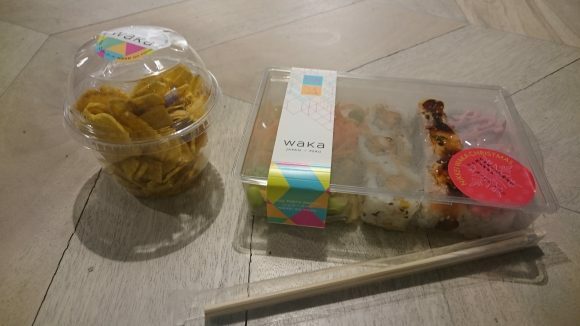 Naming aside, the Peruvian influence in the setup was unclear, but the katsu sauce on the chicken rolls certainly ticked my Japanese boxes – it’s been a while since my last proper katsu curry and I happily munched away on these like someone with a vitamin B6 deficiency. The smoked salmon and cream cheese rolls were perfectly decent creamy canapés with a good balance of fish and cheese, and I liked the zingy sesame glaze on top. The turkey rolls – the most Christmassy of the trio – were not so successful. Flavourless cylinders of grey gloop with some overly sickly cranberry were not worth breaking my meat-fast for, and the bright pink sauce on top was both terrifying and disappointingly bland. The salad elements felt unusually healthy for a festive lunch, but the sprouts (usually my leave-at-the-side-of-the-plate component of an Xmas dinner) were doused in enough grease to actually make them acceptable. Overall the meal was satisfactory, though it was a shame that the tastiness level was inversely proportional to the Christmassiness level throughout. Plus, the novelty of eating a wobs lunch with chopsticks could not be denied. There’s potential for so much more! Itsu, Wasabi, Abokado – the (rice) ball is in your court.